Representative Andy Harris (R-MD) has asked colleagues to sign a letter urging the U.S. State Department to improve relations with Hungary and end the Obama-era policy of funding media to “interfere in Hungarian elections”. The request, circulated Tuesday, called on fellow congressmen to write to Secretary of State Rex Tillerson to suspend a $700,000 grant to support “objective media” to “lead to democratic reforms” in NATO ally and European Union (EU) member state Hungary. Breitbart London reported in November on the State Department’s commitment to finance what it calls “democracy and human rights programming” by “support[ing] media outlets operating outside the [Hungarian] capital … to produce fact-based reporting and increase their audience and economic sustainability”. Rep. Harris wrote that the Obama administration’s “cold-shoulder[ing]” of the Central European nation turned Hungary “into a pariah state”, and called the Notice of Funding Opportunity (NOFO) a “misguided antagonism of our democratic ally”. The Republican congressman for Maryland called Hungarian Prime Minister Viktor Orbán “an outspoken defender” of Western civilisation and of Hungary’s “traditional values and cultural heritage… and the leading European voice against mass immigration and the hegemony of Brussels”. Rep. Harris, who is of Hungarian descent, believes that the State Department funding “opposition media in a democratic country” represents “the latest in a string of State Department actions insulting and undermining the center-right government of one of the United States’ closest allies in Europe”. When the $700,00o0 grant was announced, the Hungarian government criticised the State Department for what it regarded as interference in its internal affairs ahead of national elections in Spring 2018. Last year, the Hungarian parliament passed a law ensuring greater transparency of foreign-funded bodies which both Brussels, the administrative capital of the EU, and the State Department condemned. Harris, co-chairman of Congress’s Hungarian-American Caucus, also pointed to the conservative leader’s early and sustained support for U.S. President Donald J. Trump, and criticised interference in the Central European nation’s affairs by billionaire open-borders financier George Soros whose Open Society Foundations funds progressive, no-borders NGOs such as the Hungarian Helsinki Committee. 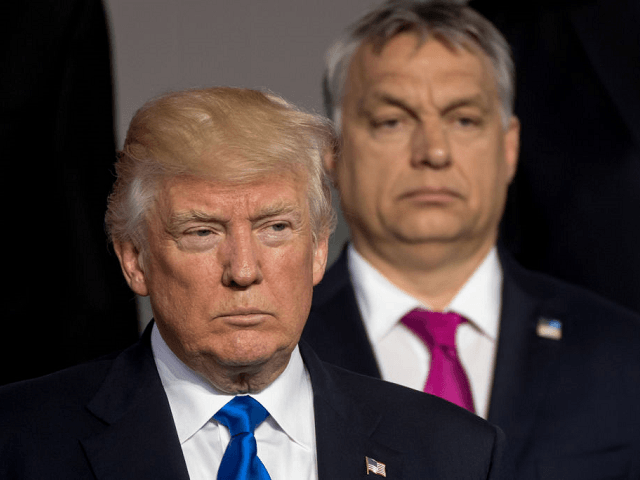 “Prime Minister Orbán has been a vocal supporter of President Trump since early on in the campaign and Orbán’s approaches to many policy issues including defense, security, antiterrorism, foreign policy or immigration closely mirror those of President Trump. On Wednesday, a Hungarian government spokesman announced that following a national consultation, Hungarians overwhelmingly reject the “Soros Plan” to relocate Middle Eastern and African migrants in the EU via a mandatory quota system.